One of the many appellations of Jesus is the Great Physician. Throughout the Gospel, we find Jesus demonstrating his power to forgive sins by showing he has the power to heal ailments. St. Luke states this perhaps the clearest in chapter five: “Jesus answered and said to them, “Those who are well have no need of a physician, but those who are sick. I have not come to call the righteous, but sinners, to repentance.” (Luke 5:31-32) But what does that mean for us? How are we to emulate the great physician of souls? Perhaps the clearest example of being a healing presence to one another can be found in the lives of the Holy Unmercenary physicians. They are called unmercenary because they accepted no payment for the services they rendered. These physicians not only healed using their expertise in medicine, but they combined it with their belief in the dignity of the human person, and an abiding faith in Christ the Healer of All. 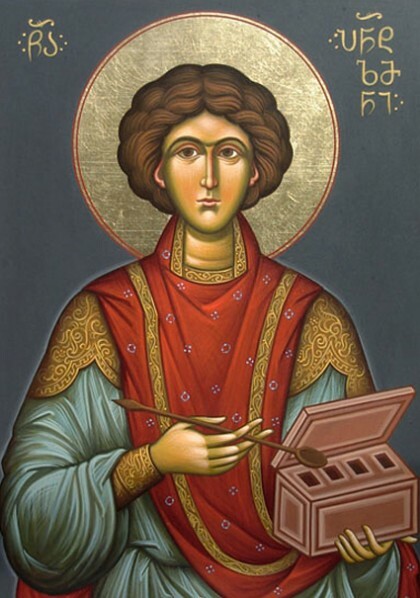 From pious tradition we are told that St. Panteleimon (3rd C.) was raised in a pagan family. After completing his education he began practicing medicine. Upon seeing a priest offering Holy Anointing to a man, he became intrigued by the devotion Christians had to spiritual healing. After a period of discernment, he was baptized. Seeking to live modestly, he gave away his inheritance and traversed Asia Minor, offering his services in charity. He came to the prisons, where men had coughs and cancer. 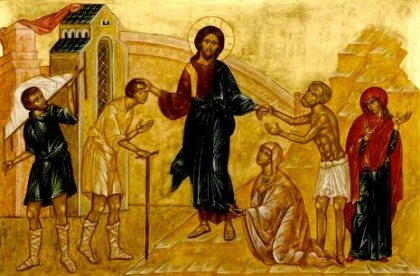 He went to the houses of the bedridden, and the crippled, praying over them and administering treatments. As his renown spread, his fellow physicians became jealous of his popularity. Upon learning he was a Christian, they notified the authorities and Panteleimon was arrested. Refusing to abandon his faith, he was subjected to numerous tortures before being beheaded by order of the Emperor Maximian. We might think that may be great an all for those with medical training, but what of us who have no medical expertise? Let us recall what St. Paul says in his epistle to the Galatians “I have been crucified with Christ and I no longer live, but Christ lives in me.” (Gal 2:20) If Christ dwells within you, than we have all the help we need. As Christ himself says "With man this is impossible, but with God all things are possible." (Matt 19:26). For everyone this means a life of repentance (metanoia--changing our hearts in greek), and learning to love what is good (Rom 5:21).